The battle with the "meet a stranger on line" continues! I thank you if you kept trying, and finally got here.. So if anyone has a clue, please let me know! Please join Tam and Jen for other entries.. I am also joining Lisa at Blessed with Grace for Tempt my Tummy Tues...check it out! Thanks for visiting and please let me know if you are getting redirected! I'm drooling from your pictures! I foresee pancakes for breakfast tomorrow! OMGoodness...those look sooo delicious and so pretty. I am pretty sure I MUST have the molds...too cute! Kat..I am so sorry you are going thru this but I did get to your site the very first time I tried and no adds as yet. Maybe..just maybe they have it fixed now. Sure sorry you might lose your blog roll..but, we'll get it built back for you. 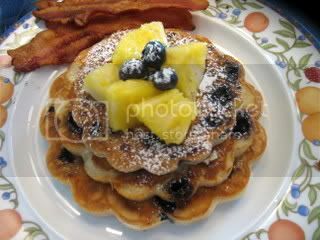 Now, I'm gonna go make some pancakes..even tho they sure won't be as lovely as these. Wow! Those are soooo awesome!! I LOVE pancakes you are so creative with them! Makes me hungry!! Kathleen, don't give up! Even without all that jazz, you're blog is still tops! 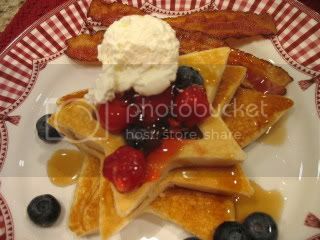 I love the pancakes three ways! Sorry to hear you are experiencing problems. I have you on my list of favorites on my blog and it showed a new entry today. So I clicked and was here, pronto. Hope you get it worked out. How yummy your pancakes look! They all look delicious. I don't really understand your problem, but I hate you are experiencing it. I had no problem getting here. Wow, these area some wonderful recipes. Thanks for linking up to Tempt My Tummy Tuesday. Kathleen, I am so sorry that you are being plagued with such a pest. I was able to get to your site with no problems. I have you on my Google reader. Hope it all works out for you soon. Oh that all just looks too good!!! No re-direct here - the pancakes look awesome!! Got here without any problems. But you are making me hungry with your delishously looking pancakes. We only make the french style of crepes here.Only when I do my Easter Brunh I make American Blueberry pancakes! Must make them more often. So great pictures! I'm sure they tasted really well. Thanks for sharing. Got through to your site - no problem. Sorry you have to go through all this. What a headache. It doesn't seem right that somebody can do that. Oh My....those sure do look good. I love all the shapes. Wow, you do an amazing job at food presentation! It all looks so wonderful. No problems this time but I will keep checking in. Now those puffed pancakes look like a recipe you need to share. Oh my! Hey Kathleen, it is caused by one pesky widget..the one that shows how many readers are at your blog at the present time. Did you have that widget? It is the redirector. I hope you didn't have to tear apart your blog too much. The shaped pancakes look so delicious. Those abelskivers are intriguing. Well, these look delicious. Love the molds. Sorry you are having problems. We tried to change servers this weekend and had some problems but all is well now. Have you checked for viruses? Good luck! 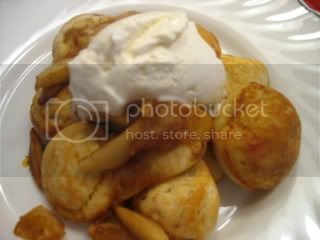 Buttered Apples and sour cream sounds great to me! The pancakes look great. Good thing I already ate today! FYI I've never had a problem with getting to your blog, but my DD#2 has my computer locked down pretty tight for anything, so maybe that's helped me. Good luck on getting it cleared up though. Have a wonderful weekend. Looks delicious! Sorry you are having problems!!! I'm sorry to hear you are having trouble on your blog. I haven't experienced any issues visiting but ever since I've changed to Firefox many of the issues I've had accessing other blogs have vanished. Thanks for participating in 'Three Or More'. Pancakes look delicious!! I have never had any problems getting on your site. I love your blog! Thanks for stopping by my blog, now I know yours exist and I can get great recipe ideas! Those pancakes look delightful and so tempting. Glad I had my dinner already! Sorry you're having blog woes..I did experience some trouble a few times coming here..but not this time. Hope all is cleared up. For some reason I want pancakes now. Yours look so yummy. Okay, I'm looking for my pitiful frozen pancackes now! Yours look so delicious and made me feel like I just HAVE to have pancackes. Those frozen things won't measure up to yours, but I've got to have one anyway. Glad your stranger meeting days are over! I want all those pancakes..can't pick! I am glad you didn't give up blogging too - I love coming here for each and every visit!